The journal is a peer-reviewed, international and interdisciplinary research journal. 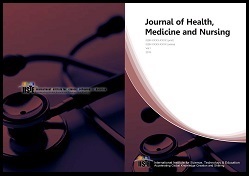 The scope of the journal includes, physical & mental health, diet, exercise, sciences on health issues, public health, self-care, occupational health and safety issues, mechanisms in medicine, technology and manufacturing of medicines, diagosis, surgery, healthcare, nursing practice, nurse training and education, nursing ethics etc. The journal also covers interdisciplinary research across the topics on policy, technological development, medicine industry. Prof. Ignat Ignatov was born on January 1, 1963 in Bulgaria. In 1989 he majored in physics from “Kliment Ohridski” Sofia University and in the same year he began his professional work in the sphere of medical biophysics. In 1996 he founded the Scientific and Research Center of Medical Biophysics (SRCMB). From 2007 Ignat Ignatov is honorable doctor in European Academy of Natural Sciences (Germany). From 2013 he is Doctor of Science and Professor in The Russian Academy for Natural History. The journal is a peer-reviewed, international and interdisciplinary research journal. The journal follows a monthly publishing schedule and welcomes original research articles, reviews, reports and case studies. The jouranl template can be download here. the authors agree to grant the first editing / publishing rights to the journal upon acceptance.